We came to NB for our son's graduation from Mt. Allison and decided to tack on a few days in PEI. Our son came with us, as did our Nova Scotia Duck Tolling Retriever, who LOVED the beach and the swimming! The weather wasn't the best to start, but we added another day, for a total of 4 nights. The last day was sunny and we came home with PEI sunburns in May! My wife and I spent eight nights at this beautiful beach house. The description on the website is quite accurate. The house is extremely clean, and comfortable. On those days when the weather was not ideal, we were happy to stay in, and enjoy the comforts offered, and the panoramic view. At low tide, we saw people dig for clams, and we watched lobster boats not too far from the shore. Mary is very helpful, and offered us local advice such as the closest grocery store, and most importantly referred us to a local lobster fisherman for fresh catch. There is a lobster, and crab processing plant up the road, and we were able to purchase some rock crab which was most enjoyable. We strongly recommend this property if one is looking for a quiet seaside property. Thank you Mary for the extra night, free of charge, wine, and all the comforts offered at your beach house. Thanks, we usually we get better weather in June, hope to see you again. Clean, comfortable and gorgeous view of the ocean! The cottage is exactly as pictured. It was spotless! There are plenty of windows so you're constantly able to see the ocean as well as enjoy the nice breeze it offers. The property is quite large and the beach is excellent for both exploring and swimming. On two different days we watched seals directly in front of the cottage, was amazing we think it was a mama and baby as one was significantly larger than the other. Mary is an excellent owner of the property. I would definitely recommend the property to anyone looking for a quieter spot on the Island. Very close by at Prim Point (20 mins tops) there is a lighthouse and a fabulous restaurant called the Chowder House - go! Make reservations if you want to be safe and not have to wait but if you do have to wait it is worth it. If you're a fan of Chef Michael Smith travel up the East Coast to Souris, he has a cute little shack there with lots of goodies and even some his own art work (who knew!). If you're looking to go for a bit of a drive, we'd recommend the North Central Coast. Dunes art store was amazing (we bought an amazing fish bowl) and Richard's seafood is excellent. We had lunch there (best shoe string fresh cut fries ever) as well as bought lobster from there market to cook back at the cottage. PEI is a very quiet, pretty Island and this cottage made our stay that much more enjoyable. This is a wonderful property. The pictures and description are as advertised. It is beautifully kept, inside and out. The house is extremely clean and well equipped. The kitchen has everything you need, the bedrooms are beautiful with handmade quilts on each bed and wonderful antiques. The living room is very comfortable with TV and satellite. There are books and movies (we didn't find the DVD player. There is a canoe, life jackets, toys, bikes & helmets. So much to do!! We were thrilled to find a property that would allow our dog to travel with us, she had so much fun running around the large property. We enjoyed several bonfires overlooking the water. We spent so much time walking on the beach and digging for clams. The owner Mary lives close by and is available if you need anything or have any questions. I would defiantly recommend this property to anyone! Thanks Sylvia, hope to have you back soon the dvd is built into the TV. Belle Isle Beach House - BEAUTIFUL! Beautiful house, views and grounds. Everything was as described and owners care about the property and the experience at Belle Isle Beach House. Hope to get back there next year. Hope you can make it back next year, look forward to seeing you. 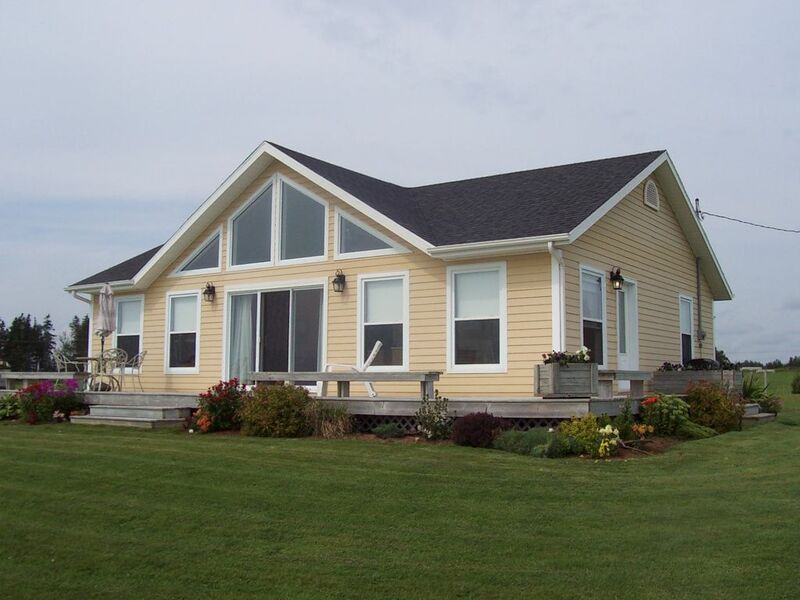 The beach house is located on the south shore of Prince Edward Island 5 minutes from the ferry to Nova Scotia, 20 minutes from the town of Montague, 30 minutes from the Capital city, Charlottetown. 50% of the rental rate is due at the time of booking with the remainder due on arrival. There are no additional taxes or fees.